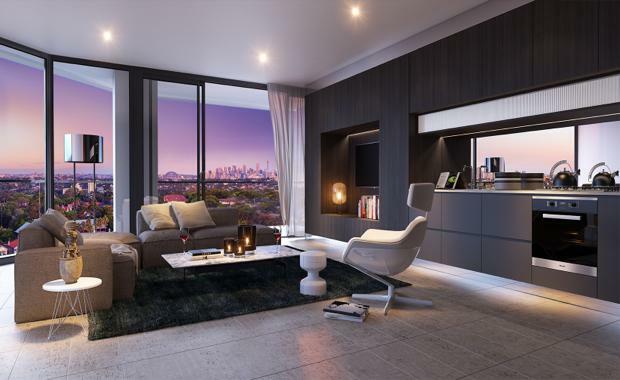 Developer Crown Group has unveiled details of its new $88 million residential tower development in Sydney's inner west. Designed by Surry Hills architecture firm Turner, the Crown Ashfield development at 168 Liverpool Road was unveiled during a VIP event held in Sydney. The nine-storey development comprises 79 boutique apartments, four retail spaces, resident and visitors’ car parking, grand lobby lounge, theatrette, piano room and rooftop communal facilities including a terrace and a recreational area with city views. There will also be an internal atrium and sculpted water feature. Crown Group Chief Executive Iwan Sunito said Crown Ashfield was an important milestone for the company as the brand continued to gain momentum around the world. “This boutique luxury development embodies our desire to redefine the boundaries of design and innovation; the architecture is sharp and refined; the forest interior concept is stunning and the view is spectacular," he said. Apartments feature plenty of internal storage and Miele appliances. Many apartments also include a multipurpose media lounge, easily utilised as additional lounge seating. Turner Principal Nicholas Turner said the building presented as a "high quality, contributory piece of contemporary architecture" that utilised natural materials for a calming atmosphere. “The metaphor of the tree is used to express the verticality of the facade screening and dramatic floating roof and also reference the natural, serene materials within the building," he said. “As one transitions from the street into the main foyer of the building, an unexpected experience of great surprise will be created through the revealing of an urban sanctuary; timber cladding, a reflection pool, planting all beneath a dynamic atrium space extending up to the roof. "Crown Ashfield is located nine kilometres from Sydney’s CBD, six kilometres from The University of Sydney, 10km from Sydney’s airport, 300m from Ashfield Mall and 750m from Ashfield train station. Crown Group Project Sales Manager Anthony Falas said there was a growing demand for high-end apartments in Ashfield. “Ashfield is becoming increasingly popular with both investors and owner occupiers for its proximity to the CBD, good schools and universities, a lively culture and convenient lifestyle amenities," he said.